What a beautiful celebration of love and longevity. I was so thrilled to be a part of Beatrice and Andy’s 10 year anniversary celebration as they renewed their vows in front of friends and family on the beach at the Ha’Penny Beach Club. 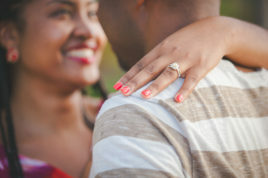 When we began the planning , I already had a special connection to Beatrice and Andy as Beatrice and I have businesses in downtown Christiansted and Andy and my husband, Jon, work together. As we got further into the planning, I was excited to find out that Beatrice Ramos of Wild Orchid was doing the flowers and decorating for this event. When Beatrice is involved you know it’s going to be amazing. 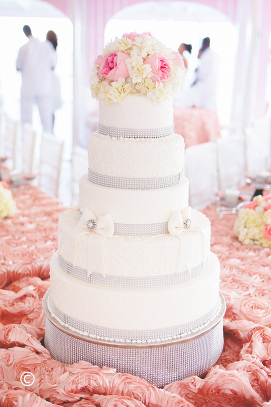 But when I arrived at the vow renewal, I was blown away by how grand the decorations were and the attention to detail that was evident in every item – big or little. As the pictures show, this was one amazing event! 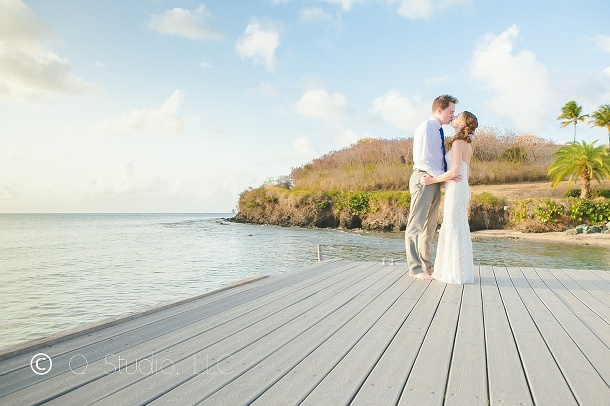 Kelly and Paul’s wedding was held on the beautiful grounds of The Buccaneer . Kelly and Paul chose one of our longer packages including pre-wedding photography with the bride and her bridesmaids, and Paul and his groomsmen, and continuing on into their evening festivities. With over 40 guests, the staff of The Buccaneer including wedding planner, Corinne Farinola, did their usual fantastic job of ensuring that all of the details were handled just perfectly! The cobalt blue accents the couple chose for the guys’ ties, bridesmaids’ dresses and other wedding accents was a great pop of color against the beautiful tropical backdrop. Kelly and Paul were such a beautiful couple. Their love shone through the whole day. I loved seeing their family and friends honor this beautiful day. I always have so much fun celebrating with the couple and their guests during the post-ceremony celebration. The toasts to the couple demonstrated how much love and support they have from their family and friends. Everyone shared in their joy during the evening of dancing and mingling. Cruise ship elopes are so much fun! I love that, of all the places a couple will venture on a cruise, they choose our island to join their union. What a treat! Julia and Arron were wonderful to work with! Cindy Clearwater of Sun Celebrations took the lead on planning and made sure every detail was accounted for and in place for this elope wedding at the Palms Hotel. I know I have said it before, but I love elopes because it gives the couple an opportunity to think outside of the box. For starters, elopes can happen at anytime. 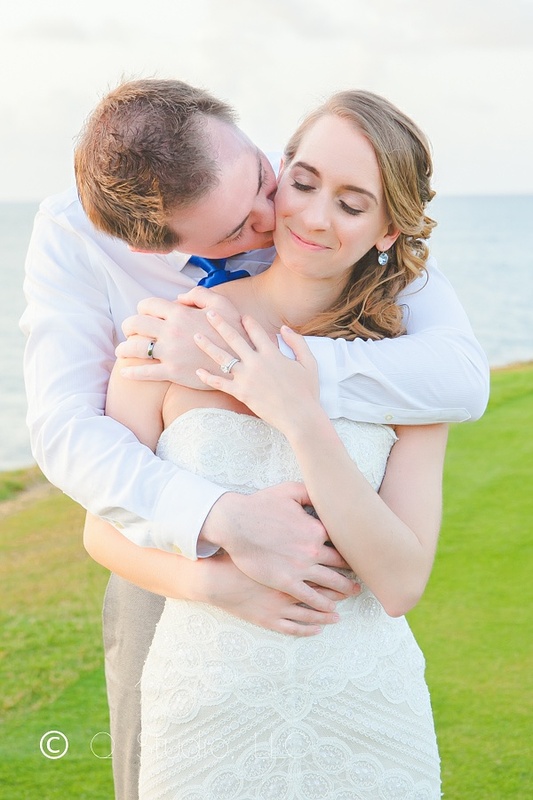 Because Julia and Arron were cruise ship passengers, their wedding began at 11:00 am. The colors you get here in the morning are so vibrant. Most of my clients are obsessed with sunsets and I get it. Yes our sunsets are unmatched, however, for me nothing beats 10AM on St. Croix, but I digress. 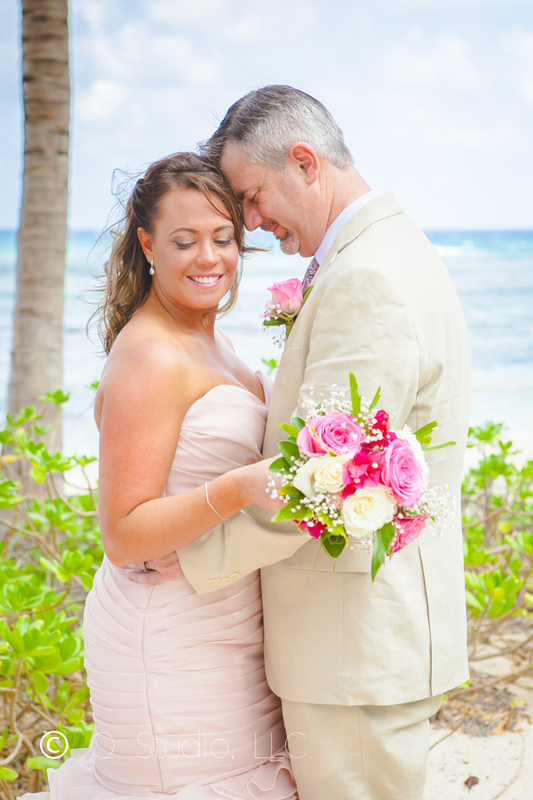 Julia wowed her groom with a stunning blush colored gown. The mermaid cut of the dress accentuated her shape and transitioned to the ground in a flood of soft, flowing ruffles. 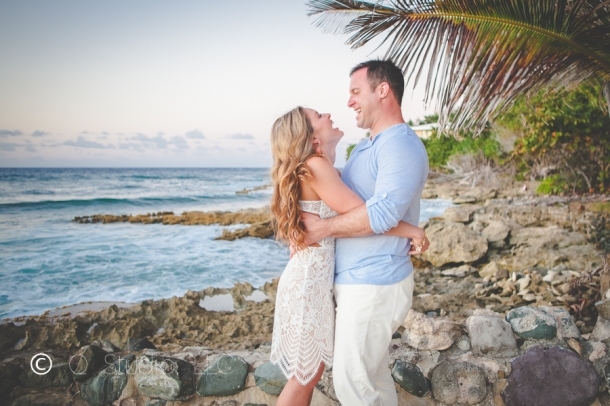 Photographing Julia and Arron within the palm groves against the aqua blue Caribbean ocean seemed almost unreal. The ceremony although short was emotionally heartfelt. 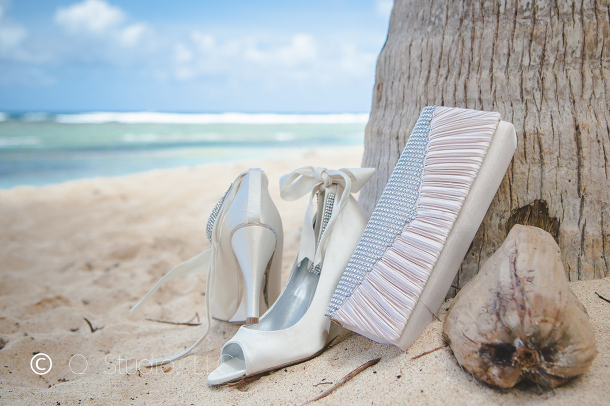 Following the ceremony, cake and champagne, Julia, Aaron, and I had a blast taking photos on the beach. I use this time to learn even more about my clients. During our time together I learned Julia and Aaron were avid Detroit Tiger’s fans. In the last set of shots they broke out their Detroit hats to create a playful memory. 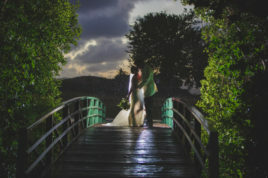 When it comes to large, elegant weddings on St. Croix there are only a handful of venues who handle them successfully, The Renaissance Carambola is one of these venues. This rule goes for wedding planners as well. Thankfully I have had the pleasure of working with the best throughout my career. For Brittany and Benji’s wedding, Leslie Dawson of Perfect Weddings of St. Thomas led the charge. 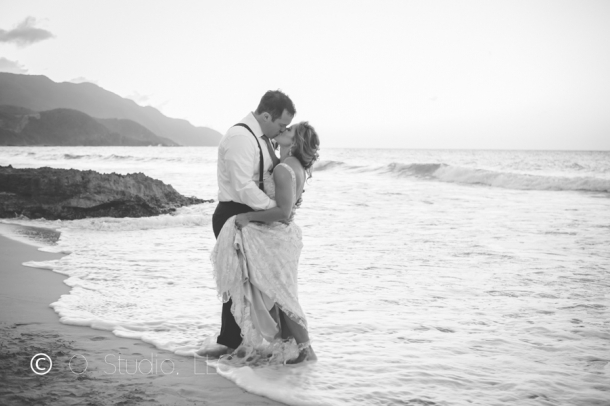 We met with Brittany and Benji during a site visit nine months before their wedding. 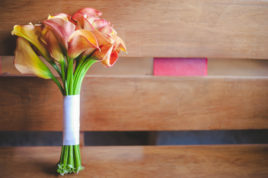 Like most client meetings, it was nice to connect with my clients and get a feel for their wedding plans in a relaxed environment. During this initial meeting we discussed our connection to the midwest while Chef Eddy brought out beautiful entrees from the Carambola kitchen for Brittany and Benji to sample. The four of us covered a lot of ground that day and solidified the coverage plan for their wedding. The wedding day flowed smoothly and everyone in attendance was present and energized. Brittany and Benji’s bridal party included 12 people which made for a very busy and very entertaining getting ready session. I loved getting to Brittany’s room and seeing that even in the chaos there was order, the room was neat, and all of her bridesmaids were wearing matching robes with their names on them. This was such a nice touch. Large weddings can feel overwhelming for even the most seasoned vendors due to all the moving parts. However, I felt completely at ease. I had photographed the rehearsal dinner held at The Waves the night before, and within this relaxed setting, I became familiar with many of the wedding guests and their connection to the bride and groom.  This made for more knowledgeable coverage of the guests and wedding events throughout the day. It was so wonderful to see all of Brittany and Benji’s plans come to life. There were so many memorable moments from this wedding, however some of my favorites include watching Brittany and Benji’s faces as they watched wish laterns fill the night sky. Another memorable moment was watching Benji’s reaction to Brittany as she walked down the isle. Finally, some of my favorite memories were from the reception. Brittany, Benji, and their guests really know how to have a good time. From the Photo Booth to the dance floor an amazing time was had by all…see for yourself! What a wonderful and beautifully blessed couple. I had the pleasure of meeting Ashley and Steve a couple of days before the ceremony at Villa Solitude to discuss day of details. Upon meeting, we hit it off right away. As we made plans, I could tell something was troubling Ashley. She then mentioned she was waiting for a box to arrive via the post office. This box was important because it contained ALL of her wedding decorations. After numerous attempts to track the package, she feared that her wedding would be bare. It pains me to see a bride in distress so I jumped in to help. One of the benefits of being on a small island is that we are a tightly knit community. You can’t but help make friends from all walks of life and all types of industries. You never know when you may need a favor, or when you may be called upon to help a friend in need. In this case I called one of my good friends and colleagues in the wedding biz, Beatrice Ramos of Wild Orchid. I told her about the lost package and Beatrice without hesitation saved Ashley’s day. Beatrice puts the B in busy, so it was truly a gift that she was able to help on such short notice. On the day of the wedding everything went smoothly. Ashley and Steve looked amazing, the reception area was beautifully decorated, and the day was perfect. This wedding was a very emotional event, not only for the bride and groom, but their families as well. There wasn’t a dry eye on the beach during the ceremony. My most memorable moment was right before the ceremony as all the jitters were beginning to set in. Ashley’s two best friends surrounded her and prayed over her. It was truly a blessing to be a witness to the events of Ashley and Steve’s day. © 2015 Q Studio, LLC|ProPhoto 5 Designed with love by Seaside Creative.